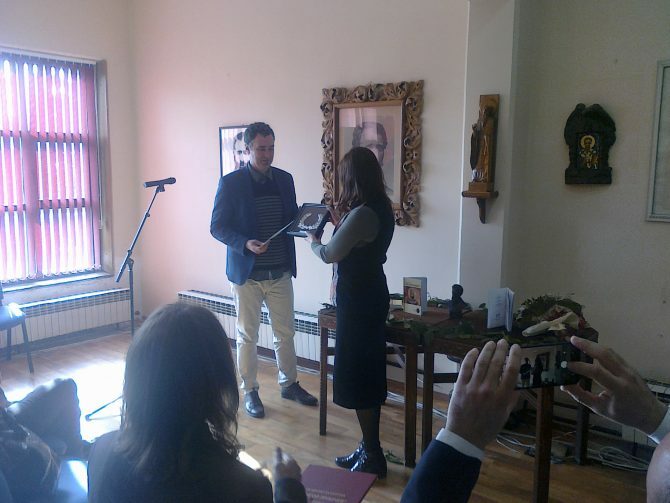 As part of this year’s Prlichev Orations event in Ohrid, Slavcho Koviloski was officially awarded the 2018 Grigor Prlichev long poem prize for his “Krali Marko the Second Time Around” (“Krali Marko po vtorpat”). Koviloski said the award is an incentive for him to continue writing well. “It’s a great honor to receive the award that bears Grigor Prlichev’s name,” he added. His long poem, Koviloski said, tells the story of Krali Marko’s reawakening and facing the world today. Unfortunately, organizers said, this year’s Grigor Prlichev long poem contest had the fewest entries so far. “We received only eight manuscripts this year,” award jury member Natasha Avramovska said. “Interest in the award is waning,” she added. “I think it’s because the laureate’s publication has not been given much space on Macedonia’s public scene over the last few years. Organized by Ohrid’s Cultural Center that bears his name, the Grigor Prlichev best long poem contest is held annually to pay homage to the 19th-century Ohrid-born poet, translator, and author of the award-winning “O Armatolos” (“Serdarot”). Considered one of the founders of Macedonian literature, Prlichev composed “O Armatolos” (“Serdarot”) in 1860, and entered it into the Athens University poetry competition, winning first place. He later translated it into Macedonian. Koviloski (b. 1978 in Skopje) is a poet, fiction writer, and literary historian.